You know, I’m not one to typically like comics or the whole comic book universe, but Watchmen has to be one of the exceptions for me. I first watched the movie Watchmen about a year ago and completely fell in love with it (unlike the masses who have hated on it). The comic really parallels the movie in the fact that it’s dark and gritty and shows a side of comic book heroes we don’t typically see; what happens after they’re not allowed to fight the bad guys anymore and must deal with the regular avenues of everyday life. I really like how the comic also focused on other “normal” people living in New York and what they were thinking of this alternate time period. Watchmen also employs a couple of different subplots and backgrounds that really get you involved in the story and keep you guessing as to what will happen next. 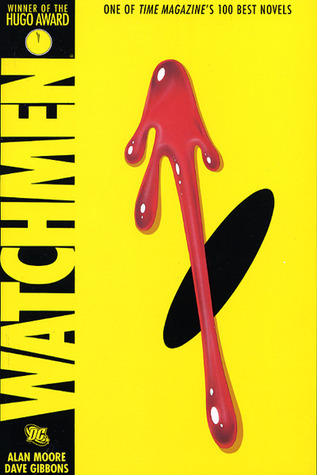 I know that now there are some other comics that have been released that go into each character’s backstory, which I have not read, but after reading Watchmen I totally want to read those! Anyways, overall I have to give this book a definite 5/5 star rating because the world building and illustrations along with the incredible dialogue sums up into one fantastic piece of work.